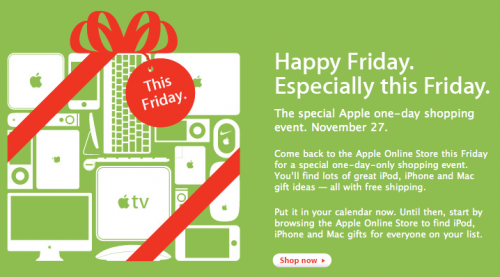 Apple has just announced that they will be having their annual Black Friday sale on November 27, 2009. Black Friday, the day after Thanksgiving is probably the busiest shopping day of the year. Several Apple retail stores and the online Apple store will be participating in the said event. Hopefully, the discounts this year will be better than last year’s $100 discount on Macs. For students who are thinking of combining Black Friday Sale discount and their student education discount, don’t even bother going thru the hassle. As with previous years, combining the said discounts are not allowed. I also suggest that you take a look at third party retailers that sell Apple products. They might offer better discounts compared to the discounts they will be giving out at the Apple stores. Might. Best Buy is currently offering $100-$200 off on iMacs and MacBook Pros through Wednesday and will be offering a $150 gift card with MacBooks on black friday, so there are some great deals going on already.